High visibility and easy setup! 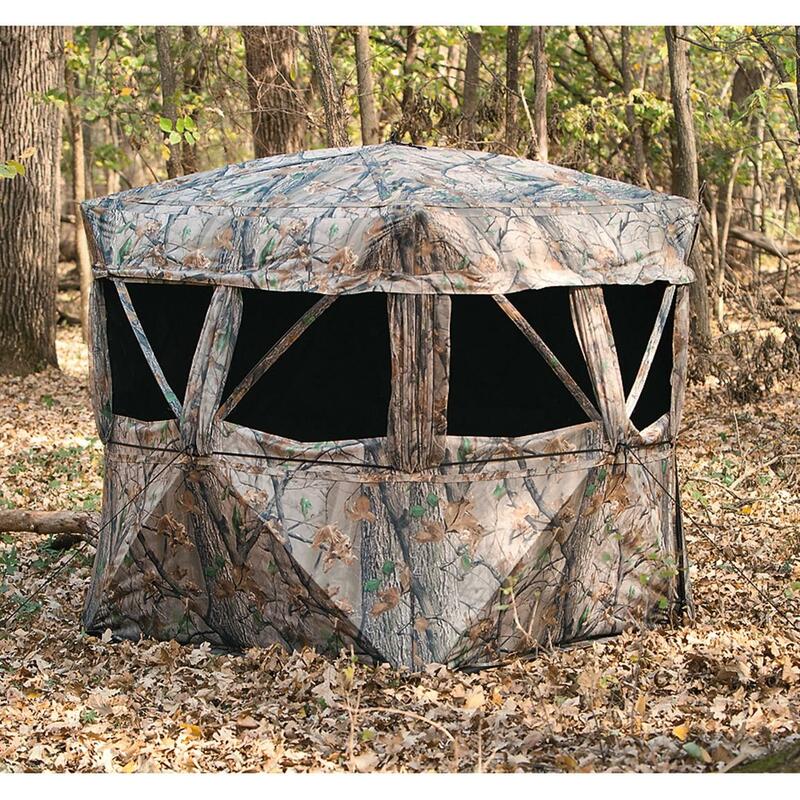 77"w. x 77"l. x 70"h.
The Muddy VS360 5-hub Ground Blind packs small, carries light, and goes up fast! 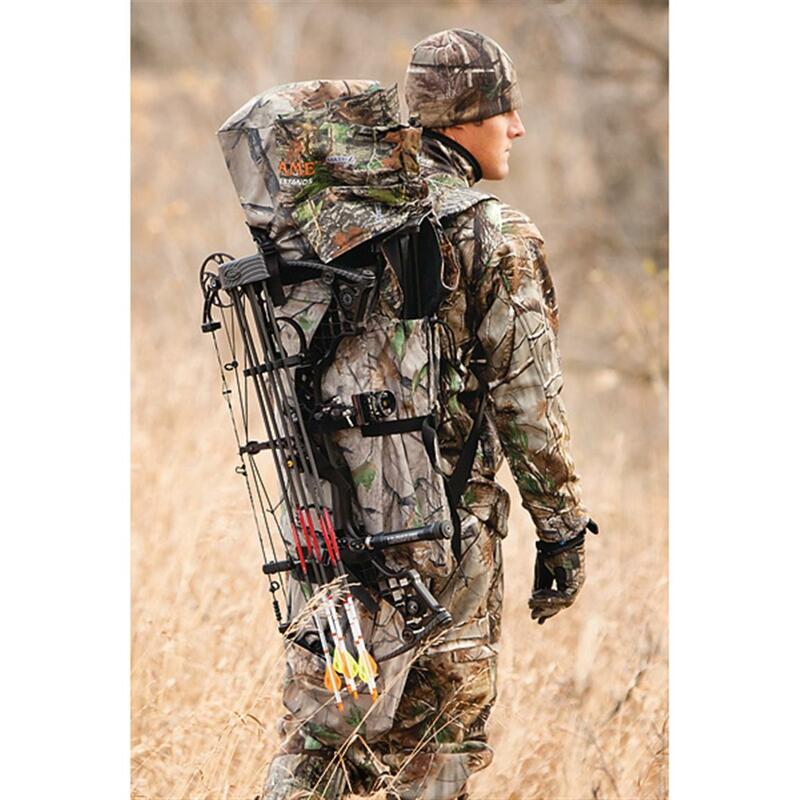 Ready for instant deployment to make the perfect hideout for your next hunt. 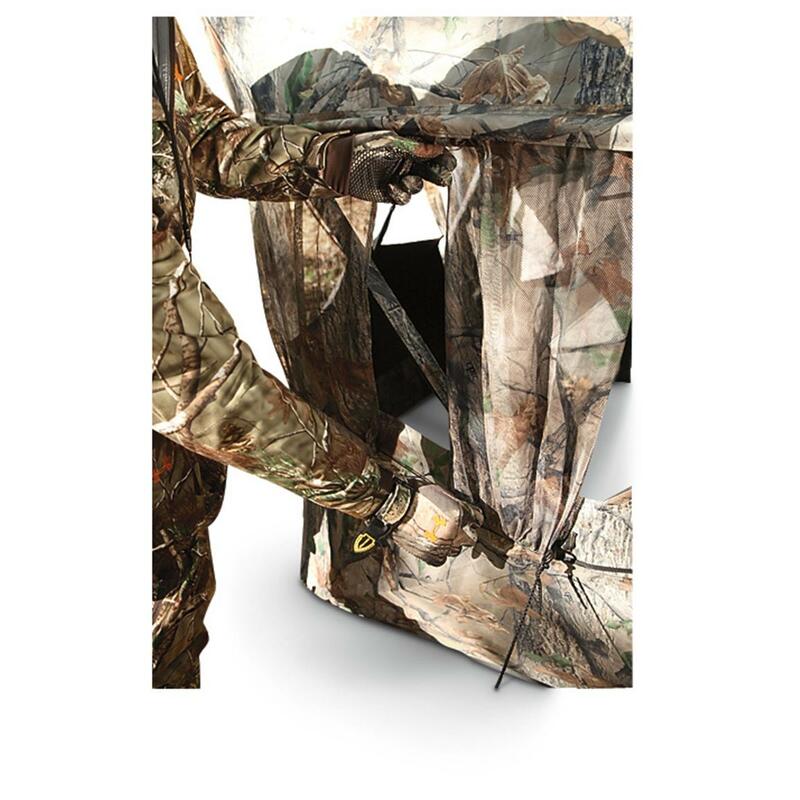 Muddy VS360 5-Hub Ground Blind is rated 4.0 out of 5 by 8. Rated 4 out of 5 by Michael Scott from Nice blind with good space for two hunters. My dad shot his first tom out of this blind. I left it out in Dec last year for deer hunting, a big wet snow storm destroyed 3 poles. My fault. Muddy had no replacement poles or hubs until just recently. I bought some and they were made incorrectly at the plant in China. Muddy refunded my money. I have drilled out the metal fittings and purchased hollow glass poles and replaced the broken poles. I have seen where people have used solid glass driveway poles to repair them. Lesson learned, don't leave up in snow storms or collapse blind when you leave. Weather proof spray is a great idea. Buy yellow plastic tent stakes, way better holding power then pins. Good product with some potential flaws. Rated 5 out of 5 by Antler from Great Durability Purchased this product in 2015. I was not a tent blind user before this purchase. It was easy to set up and take down. The window slide fabric is super quiet. It survived a couple of major wind storms and snow storms. I harvested my biggest buck ever this past November with my bow through a 3 inch opening. Love it ! Rated 1 out of 5 by Glevengo from Muddy Garbage Nice look and appeared quite functional. However, after one season in light snow, 4 broken support rods and 3 hubs. Piece of junk. Rated 4 out of 5 by Benjamin from Flex Seal on roof Regardless of the Brand. I'll always keep a can of black Flex Seal for use on ground blinds with pin holes. Flex Seal is an awesome way to get rid of rain leaks. Rated 4 out of 5 by Grizz from Could use improvements The blind is easy to set up and take down. I like the camo design and the sliding windows. It is blacked out inside. What I don't like about it is the ground stakes. Instead of the "L" shaped stakes, they have a round hole at the top for easy removal. I don't see how it will hold in a high wind condition unless you have it tied to a tree or log. I also don't care for the zippered roof. It's nice though if you like to bird hunt. It has a lot of possible window configurations which I like. It's why I bought it. Overall, I think the blind is worth the money. I bought it for bow hunting turkey and deer. It has plenty enough room for all your stuff and another person. Rated 5 out of 5 by Benjamin from GREAT!!! First huntable blind I've ever used. I didn't see any turkeys, mostly my fault. Blind did great in the rain. Although my selection of coverage was poor. I stuck out like a sore thumb. Rated 5 out of 5 by Scotty 308 from Great Great Blind Put this blind up during archery season in the Northern Zone of NYS. Left it up for 6 weeks total so it was already set up for rifle season. It withheld some pretty harsh weather. During both hunts we had some rain it stayed very dry inside the blind. Had bucks and does walking within 25 yards of the blind and the concealment windows kept us covered so we could comfortably line up out shot. Plan on getting at least one more of these for next year. I highly recommend this blind, you wine be disappointed. Rated 4 out of 5 by ADAM M from Sat it up in the back yard. Went up easy, appears to be sturdy. I like the camo pattern, the windows, it's light and easy to move around. Reflective panels keep you completely concealed. High-quality concealment that won't blow your budget!